I remember sitting on the white painted, peeling wall of pit road at a short track where local racers were competing one extremely hot summer afternoon. As I sat with the sound of idling engines only feet away from me, another gentleman came and sat on the wall beside me. He was someone I had not had many close interactions with. To be honest, he was someone who intimidated me. He had a reputation around the track as a tough guy, and I always perceived him that way as well. His look and posture fit the bill, so I never tried very hard to see what was behind that tough exterior. The first few moments together on that worn, peeling wall were awkward. I wasn’t sure if he sat there just to rest, or if he sat there because of me. After a few moments of silence (which is a very relative term for a racetrack), I made eye contact with him. Following another brief moment of awkward silence, he spoke. I was filled with trepidation because I knew who he was, at least I knew who he was according to others. The intimidation and trepidation quickly faded as I soon discovered who this man really was. I didn’t really know him until I got to know him. We all have perceptions of people in our mind that we stick with. These notions, both positive and negative, shape the relationships and interactions we find ourselves in. As with people, we all have perceptions of who Jesus is as well, positive and negative. But unlike other personal relationships, the answer to this question is of grave importance. How we answer who Jesus is determines not only our values, but our eternal destiny. John the Baptist, they replied. Elijah. Jeremiah. One of the prophets. They had heard Jesus referred to as all kinds of people. We know Jesus was called other things as well. Blasphemer. False Prophet. Drunkard. Glutton. Friend of sinners. There were plenty of names to choose from. Every day we are bombarded with images of Jesus as well. Good moral teacher. Our ticket to heaven. A “sugar daddy” in the sky. A fraud. Then Jesus turned the question upside down. Jesus asked a lot of questions throughout the scriptural narrative. He didn’t ask these for himself, but He asked them for us. Of all of the questions He asked, to me, this is the most important one. Simon Peter was quick to answer. Simon Peter wasn’t swayed by the identity that was placed on Jesus by others. He, along with the other disciples, had walked with Jesus. He’d witnessed the miracles. He’d been a part of the journey. Others didn’t have to define who Jesus was, Peter was in relationship with Jesus and KNEW who He was. As I sat on that white painted wall the identity that others painted of the man I sat next to quickly faded away because I got to know him. I didn’t need others to define him, their definitions were wrong anyway. Relationship changes the question from who do others say they are to who do you say they are. The only way to be able to answer Jesus’ question is through relationship. We can’t define Him if we don’t know Him. 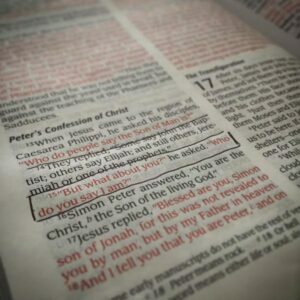 When Simon Peter discovered Jesus’ true identity through relationship, he then discovered his own identity too. We spend a lot of time asking ourselves who we are, looking for our own identity. We try to find it in our ministry or in our jobs. We look for it in our families or in our friends. We seek it in our bank accounts or in our possessions. The reality is, our identity can only be contrived one way, through Jesus’ identity. So what about you? Who do you say Jesus is? Our individual answer is of eternal importance.